After turning the boat back over about a month ago, I set to work on a long list of small tasks. Every day or two I would check off an item and move on to the next. No single task seemed especially newsworthy. 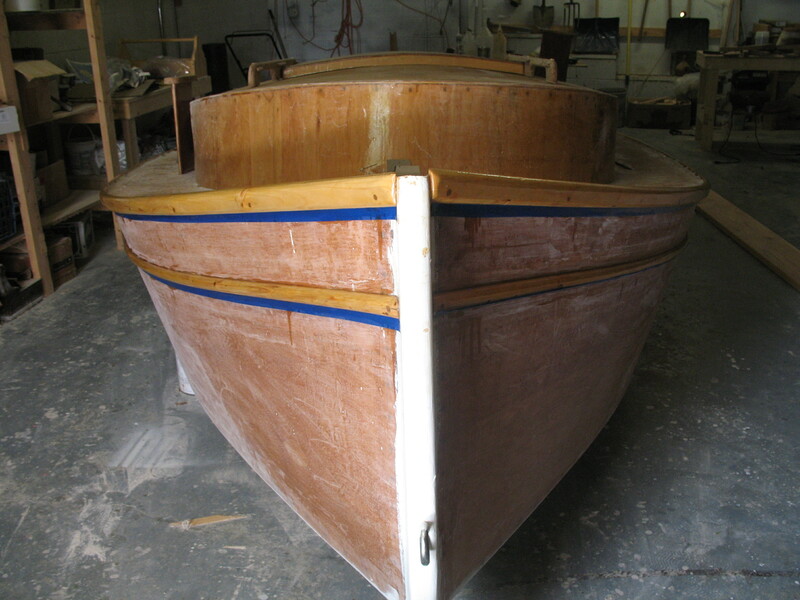 But I now realize that a great deal has changed and that—dare I say it?—the boat might be finished in as little as a month if I can keep up the current pace. There are two bilge boards, which act as off-center centerboards. 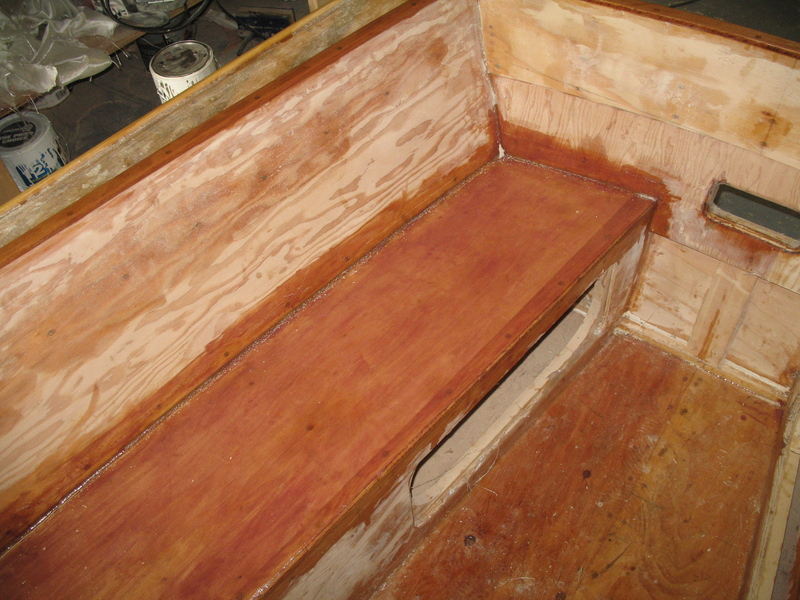 I had never heard of bilge boards before starting this project, but they are a very nice feature of the boat since they sit on either side of the hull and don’t break up cabin space. My instructions told me to build the boards from ¾ inch pine or fir, but I chose instead to laminate two 3/8 inch pieces of plywood, which is the method recommended by most other builders. The laminated plywood is considerably stronger than a single pine board and less inclined to crack or break when it hits something. I’m not an engineer so I don’t fully understand all of the technical aspects of their shape and performance, but I knew it is necessary to round the front edge of the boards and gently feather the back ends. 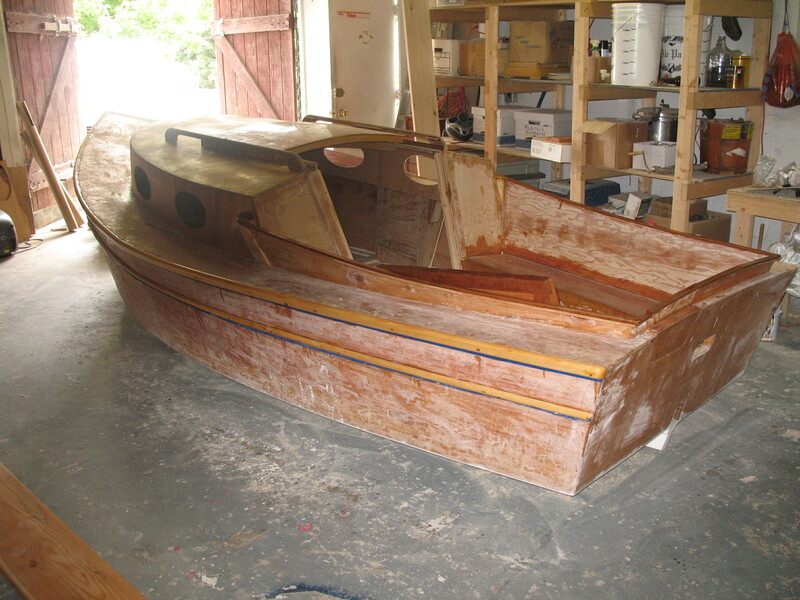 My instructions were hazy on the details, but I found detailed instructions for the proper curvature from Jim Michalak’s book, Boat Building for Beginners and Beyond. His similarly shaped leeboards look somewhat like airplane wings and I followed his measurements. I started with my hand plane and finished up with a belt sander. I then added a cherry cap to hold it in place on the deck and did a quick and dirty ‘glassing job. 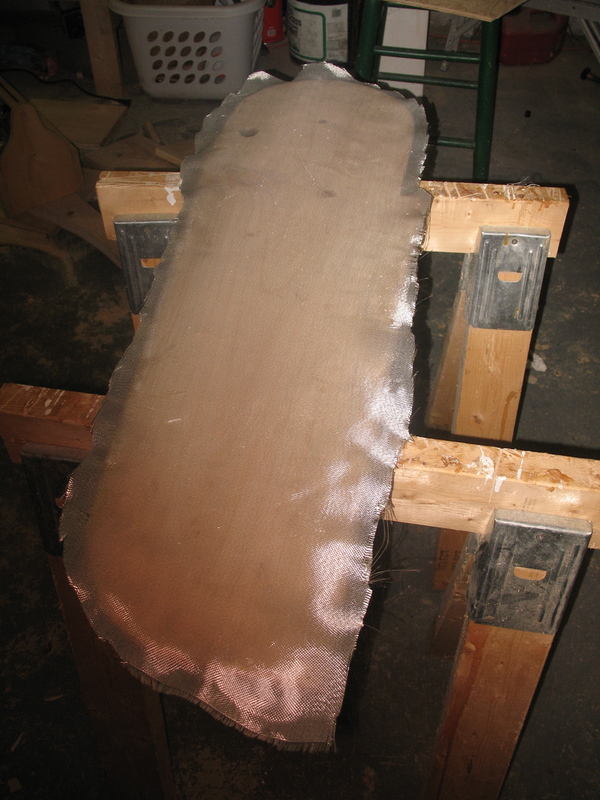 In this photo, the board is freshly glassed but not yet sanded. 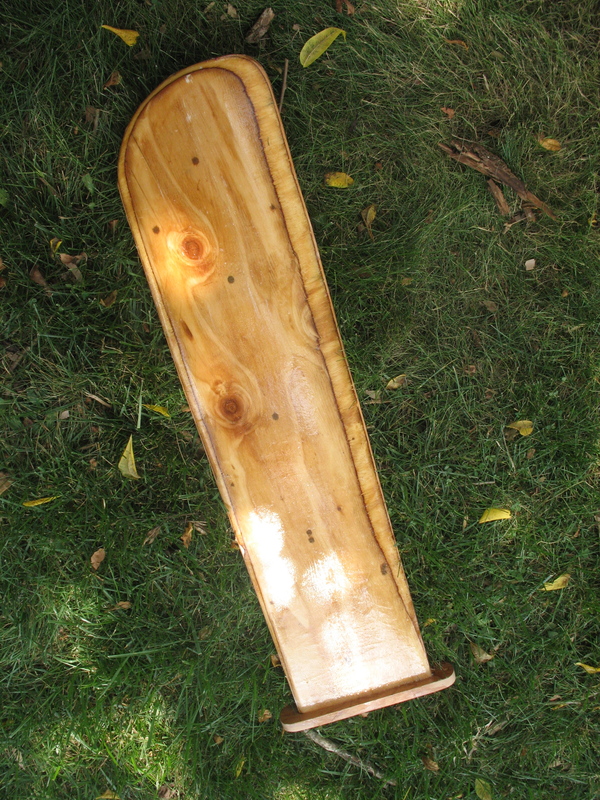 To finish this project, I will varnish the cherry and paint the boards. Front view. The blue painters tape is protecting the hull while I varnish the rails. And here's a side view. The rubrails were the next item on my list. Both are made from humble pine. I suppose cherry or oak would be more durable, but I am in a rush and don’t want to spend the money on hardwood. The instructions told me to use one inch half-round molding, but I ripped the pieces from boards in my shop and rounded the edges with my router. Both were attached with epoxy and screws, which seemed logical at the time, but I later read postings from builders who suggested using bedding compound (such as caulking) so that the rails could be more easily removed and replaced when they wear out. Apparently rubrails are meant to be replaced and are considered “consumable”. But I just followed directions and glued them down tight. Who knows, maybe I’ll be the world’s best sailor and will never hit a dock or piling. I was going to paint the rails, but decided to varnish them instead. To protect the pine, I coated the rails with epoxy and three layers of marine varnish (I’m using a brand called Last n Last). In this picture, you can see the blue painter’s tape I’m using to keep varnish off the hull. One of four portholes, ready for installation. A side view, showing the plexiglass and brass bolt. 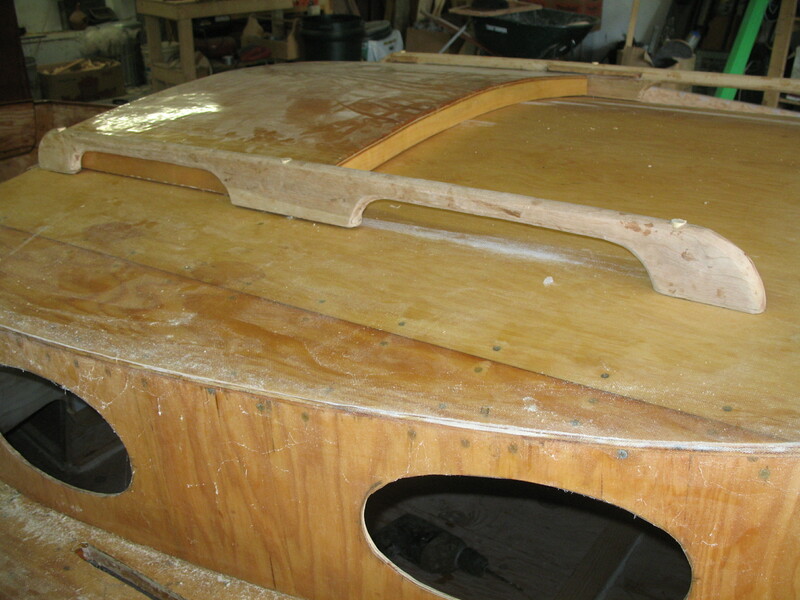 Around this time I also assembled the boat’s four portholes. Many people buy ready made portholes, but I decided to fabricate mine from ¼ inch plywood and plexiglass, according to the Stevenson’s instructions. 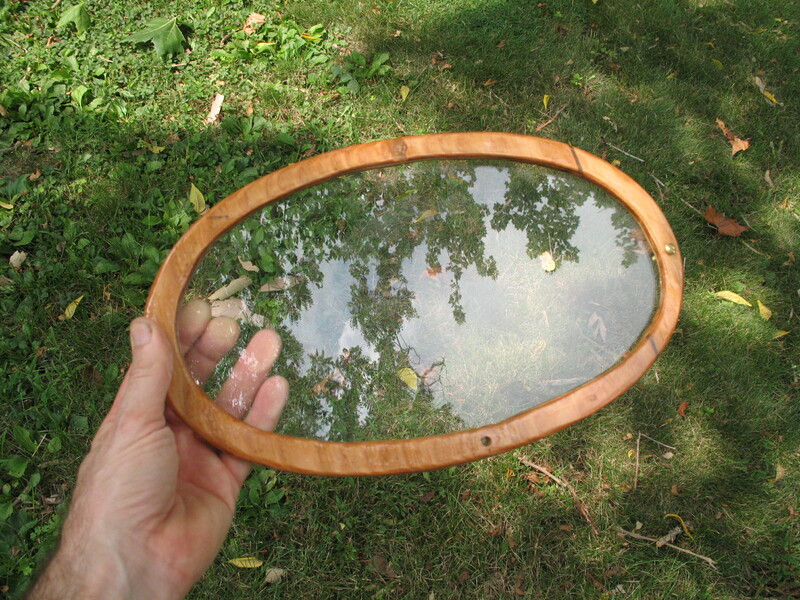 The oval porthole frame is protected with two coats of epoxy and three coats of varnish. I don’t know how well it will hold up over time, but new frames can be easily made later on. 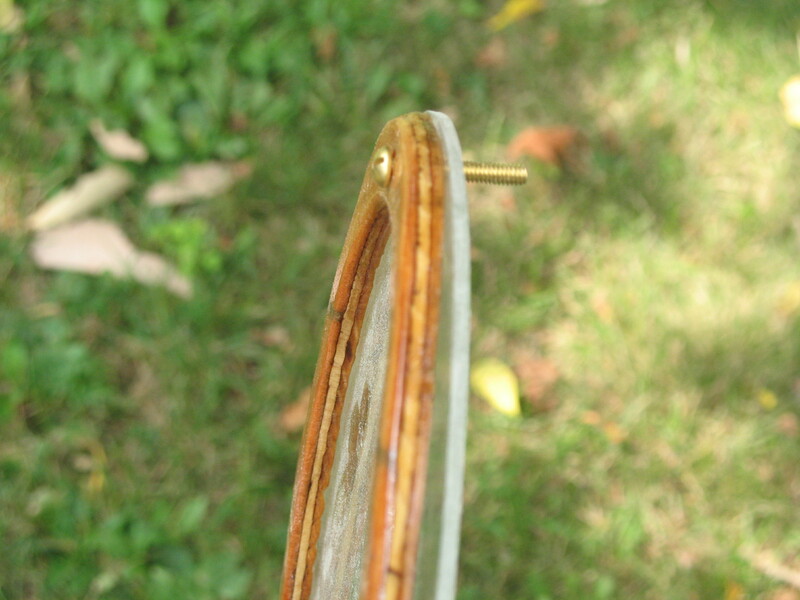 The plexiglass was easily cut with a fine-toothed blade on my jigsaw. The whole assembly will be held in place with four small brass bolts and made watertight with silicone caulking. 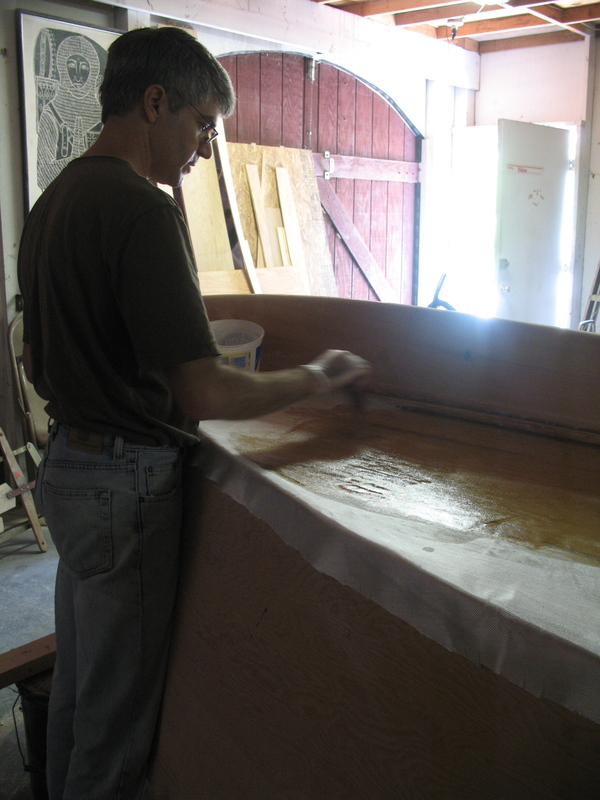 The floor and seat bottoms are fiberglassed. I have grown wary of epoxy. Rashes and persistent respiratory problems suggest that I am developing a strong allergic reaction to the harsh chemicals (symptoms listed on the West Systems Web site describe my conditions perfectly). 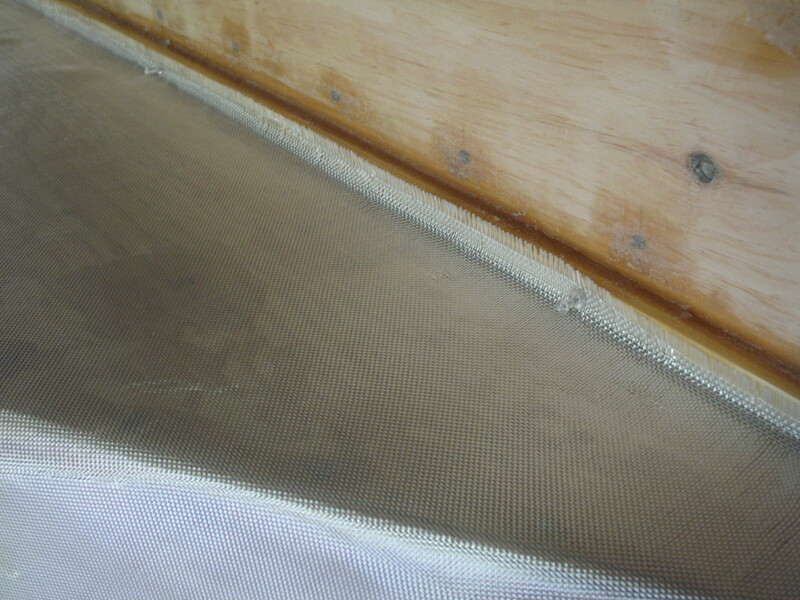 Fortunately, I was able to finish glassing the hull and decks before my condition worsened. But I still had to work on the cockpit. Taking a minimalist approach I decided to only ‘glass the cockpit floor and the seat bottoms, which are the most exposed and wettest parts of the cockpit. This means I am not ‘glassing the seatbacks or cabin bulkhead; they will simply be painted. I also view this as an experiment. 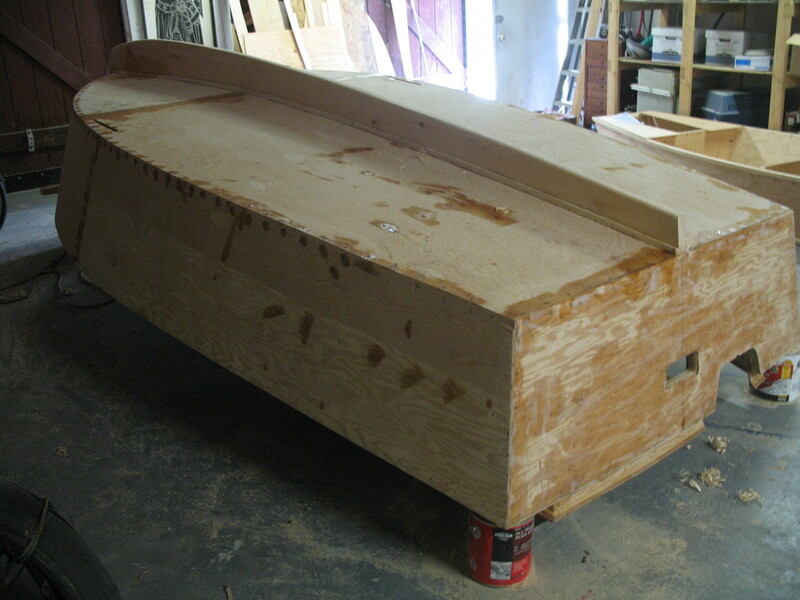 I repeatedly hear that exterior grade plywood will check if not fiberglassed. 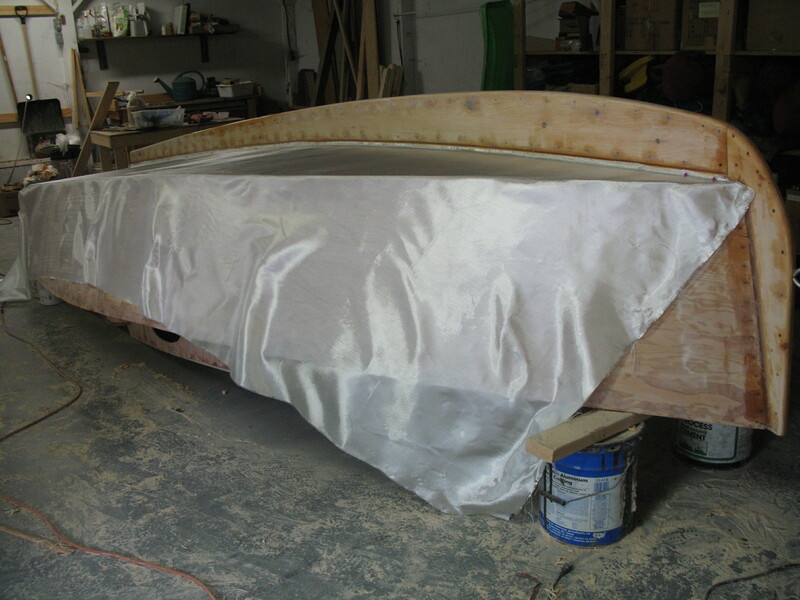 But I also hear about exterior grade plywood boats that have been sailing for years with nothing more than paint for protection. So I want to know how quickly and how badly plywood will check. If the answers are “not soon” and “not much” then I will take an even more casual attitude toward fiberglassing in future projects. I built the hatch cover nearly six months ago as a winter project, but it was time to get it installed. I added some edging around the opening in the cabin roof so that the hatch can slide back and forth like a train on a track. The edging, I assume, will also keep out water and rain. The handrails double as a guide for the sliding hatch. I shaped them with a router and secured them to th roof with bolts. A front view of the handrail and hatch, showing the sliding rails. The handrails were especially fun to finish. I rough cut both from cherry some months ago, but I still needed to round the edges with a router. 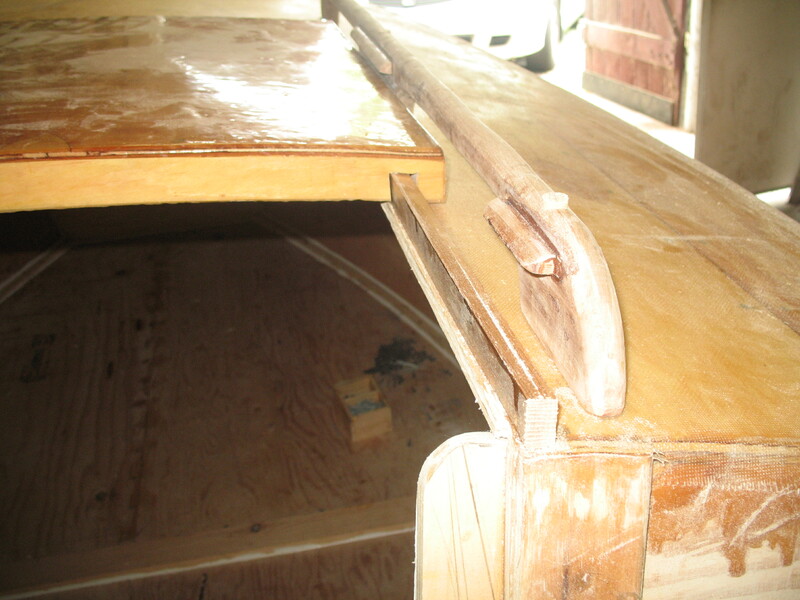 I also added quarter round molding (also made from my cherry) to hold the sliding hatch in place. Finally, I drilled three ¼inch holes down the top of each rail and inserted four inch stainless steel bolts, which go through the cabin roof and hold the rails in place. In this picture, the rails are temporarily bolted in place, but won’t be securely set until the cabin and sliding hatch are painted. There are still many unchecked items on my to do list. I need to build the mast (probably within a week or two), make the sails, finish painting and…well, you get the idea. When it’s time to sail, you’ll be the first to know. I’m ahead of schedule and feeling motivated. After spending several more hours filling and sanding the cockpit and decks, I was ready to turn the boat over by midweek. But how do you flip a 500 pound plywood box without damaging or (gulp) destroying fifteen months of work? I could easily imagine scenarios leading to crashes and disaster. Frankly, the boat looks boring upside down. This is a little more interesting. Plus, you can see how the cabin is off the ground. My plan was simple: lift the boat onto its side, then gently ease it over so that it was resting bottom up. But I didn’t want to lose control of the boat at a critical moment and I didn’t want the cabin roof and cockpit coaming to bear too much weight (and possibly crack) while being turned. The key to maintaining control of the boat was to recruit as many willing volunteers as I could find, so I dragged my wife and three children to the garage promising that the work would “only take a minute” and that it would “even be fun.” Meanwhile, my insurance policy against cracking and breaking was to cover the garage floor with lots of padding. I had heard that some builders roll their boats onto tires, so I cut down an unused tire swing from our yard and rolled it into the garage. I also dragged over a bale of peat moss and about five rolled up sleeping bags. Lifting was easy. The whole family pitched in, but it could have been accomplished by two people, or even one fit and determined builder. In a moment the boat was resting on its side—slightly tilted, of course, but in no immediate danger of falling. While my wife and the younger kids made sure it didn’t fall back down, my oldest son and I positioned ourselves on the opposite side of the boat and nudged it toward us. We had no difficulty controlling its decent and it gently rolled onto our carefully positioned cushions. The job was accomplished and the boat was safe. Our final step was to lift the boat off the ground so that it wouldn’t have to rest on the cabin roof. 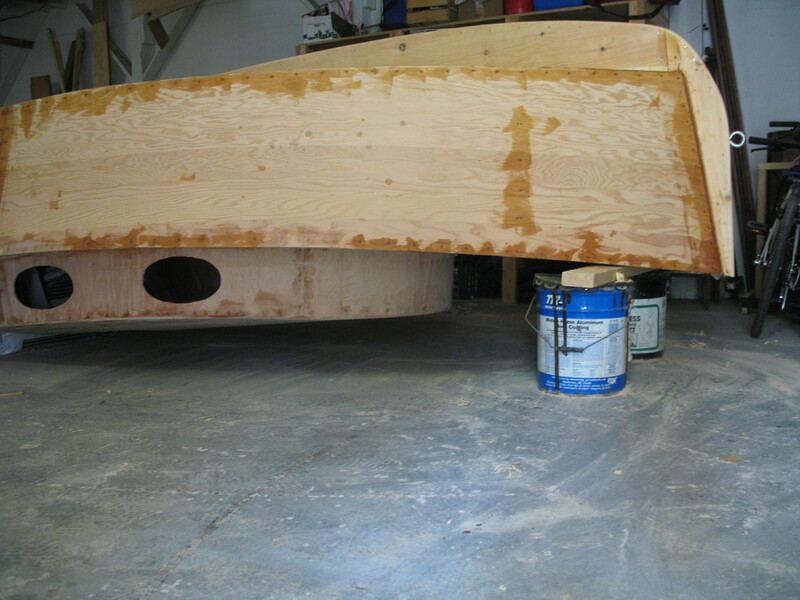 For this, I placed two paint cans at each corner of the transom and rested the bow on a short length of 2×4 set between two larger cans. Again, lifting the boat onto these supports was easily accomplished by the family. The boat now sits off the ground and neither the cabin nor coamings are pinched. I am now looking at parts of the boat I haven’t seen for nearly a year. It brings back memories and emotions from the first days of building. Seeing the keel–the first thing I assembled–reminds me how anxious I was about the project during the first weeks of building and how determined I was to not make mistakes. I now see how meticulously I positioned each screw and how hard I worked to fit the laminated keel pieces together without any gaps. 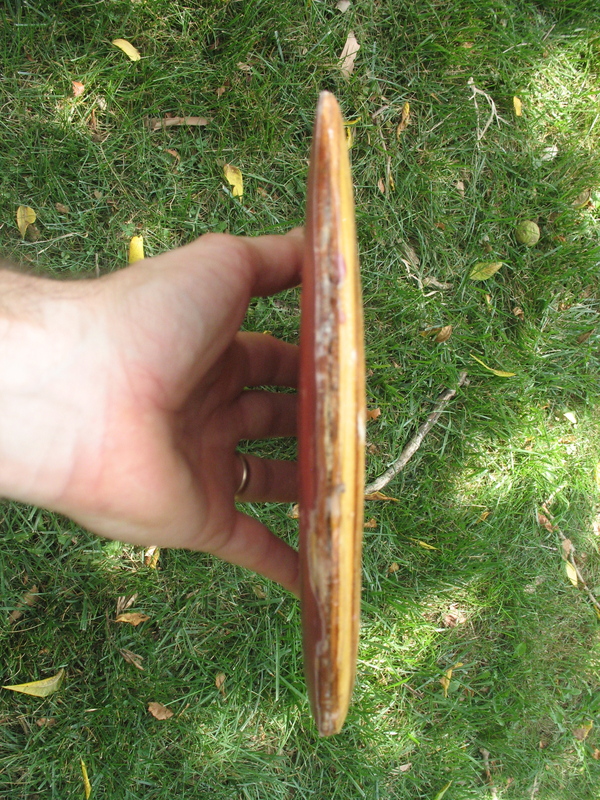 And I recall how stressed and frustrated I felt when I found small gaps in the lamination despite my best efforts. At the time, I had little understanding in my materials and no faith that my boat would float. Make one small mistake, I believed, and the whole thing would dissolve on contact with water. Now, of course, I take a far more philosophical view of my work. I still don’t know how well my boat will sail or how well it will hold up after a season or two. But I’ve learned a great deal and overcome many barriers, so I no longer fret about small mistakes. That’s what epoxy’s for! I say. I have already started filling and sanding the underside and, if I can open up a free day, I should be ready to begin fiberglassing within a week. More humbling lessons await as I tackle the next and—quite possible—final big hurdle. Two months ago I walked out of my garage, midway through the construction of the rudder and cockpit seating for my Stevenson Pocket Cruiser. I thought I would be away for a few days while a midwinter cold snap passed through. But three snow storms, four feet of snow, and endless days of grey skies ransacked my plans. I huddled in my house like a refugee. I tried to be productive. 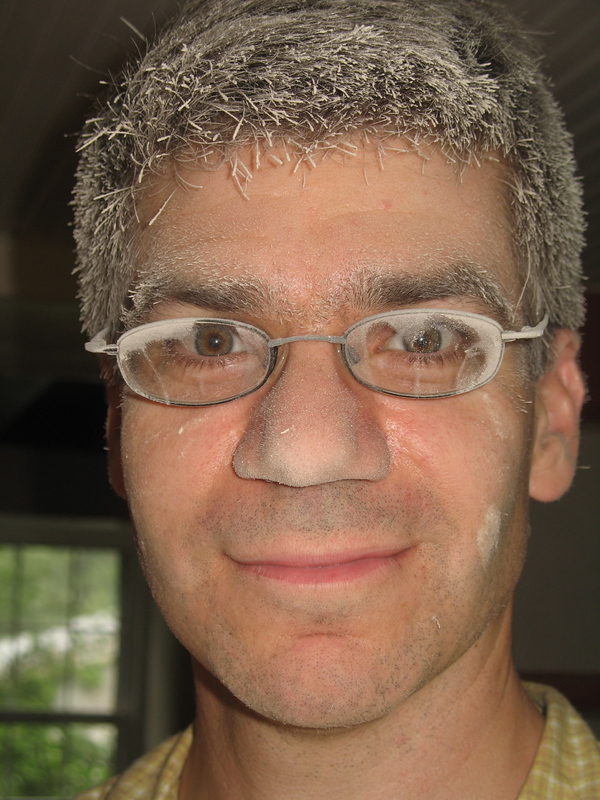 I finally tackled a long-planned bathroom renovation and repainted the kitchen walls. But I only visited the garage when I needed to grab a tool. I offered silent apologies to my boat, which looked abandoned and forlorn in the cold air and dim florescent light. 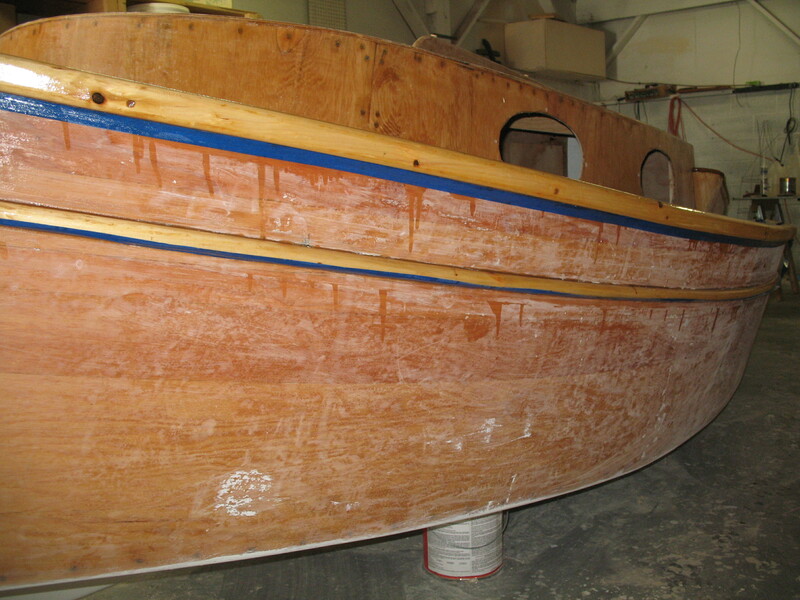 These long breaks can be dangerous for amateur boat builders. Momentum is lost and, as attention shifts elsewhere, the sense of urgency and excitement can dissipate. Once or twice, I looked at my boat with detachment and wondered why I started building it in the first place. Was it a temporary midlife madness? And if so, what do I do now? Not for the first time, I wondered how I could get rid of an uncompleted hull. But as February passed, the icy path to the garage melted, temperatures inched up a few degrees and the outside world looked less forbidding. Skunk cabbage—a reliable precursor of spring—poked green tips through the shallow waters of a nearby marsh and, like other warm blooded creatures, I started stirring from my den. My thoughts turned to the boat. With a warm coat, gloves, and hat, I went back in the garage, ready to pick up where I left off, but after so many weeks of inactivity, I felt like I was staring at someone else’s project. I found the rudder in several parts, epoxied but not assembled. I know I had purchased the bolts needed to put it together, but where were they now? Before the interruption, I was also preparing to cut the cockpit seat backs—I could see some rough lines scrawled on a sheet of plywood–but they now looked as mysterious as ancient hieroglyphics. What, exactly, did I have in mind? It all looked so daunting, but I forced myself to start work. I found the missing bolts (they were still in the bag from the hardware store) and attached the rudder blade to the stock. 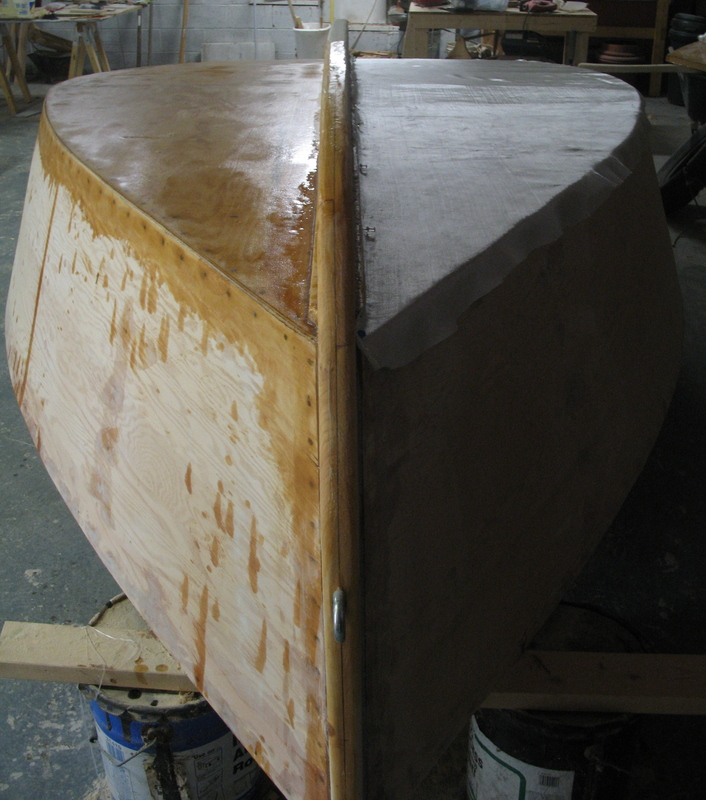 I had already rough-cut the tiller, so all I needed to do was sand it smooth, drill two holes and bolt it into the rudder. 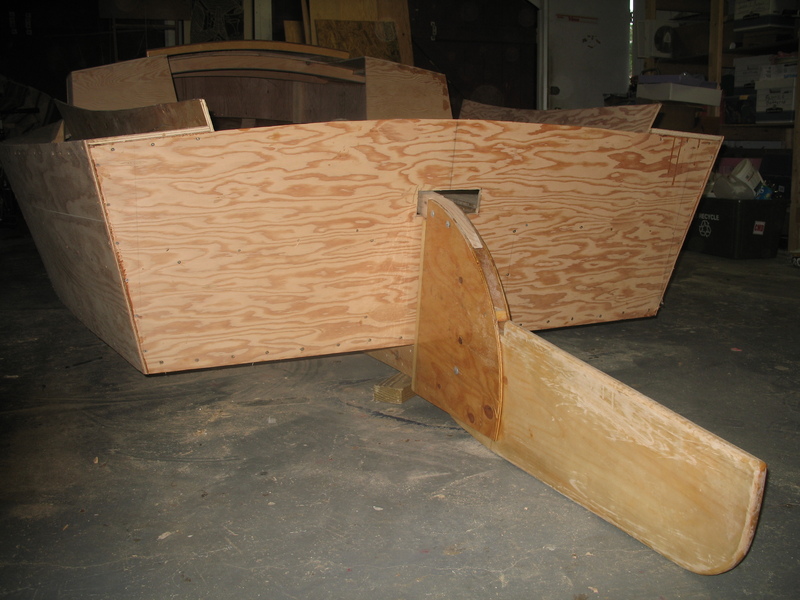 Two hours later, the whole assembly was finished and I slid it into place against the boat’s transom. With the addition of this simple but unmistakably “boaty” mechanism, my wooden box is now looking more like a real sailboat. More importantly, I have something to do while sitting in the cockpit; I can swing the tiller back and forth while squinting into the imaginary horizon. You can read the rest of the column on Duckworks.